Dr. Cooke is an Assistant Professor in the Department of Medicine, Division of Pulmonary & Critical Care, and Directs the Program in Epidemiology & Health Policy for the Michigan Center for Integrative Research in Critical Care. After graduating from the University of Michigan College of Engineering and the Ohio State University College of Medicine, Dr. Cooke completed his internal medicine training and pulmonary & critical care fellowship at the University of Washington. During his fellowship he earned a Masters of Epidemiology from the University of Washington School of Public Health. 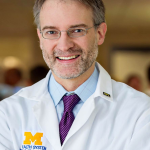 Dr. Cooke joined the U-M Medical School in 2009 as a Robert Wood Johnson Foundation Clinical Scholar; he completed a Masters of Health and Healthcare Research from the University of Michigan’s Rackham Graduate School. Dr. Cooke’s research program seeks to understand how healthcare policy, the healthcare system, and individual patient characteristics impact the quality and efficiency of care delivered to patients in the intensive care unit. This work involves a number of broad interests and includes: (1) characterizing the drivers of variation in the use, quality, and costs of critical care services, with a specific focus on regional and organizational contributors, (2) development and evaluation of policies to improve the care of patients with sepsis, and (3) understanding and removing racial, socioeconomic, and health insurance based disparities in critical care. Methodologically, this work employs the traditional tools of health services research including analysis of both clinical and administrative databases, outcome prediction, implementation science, multi-level modeling, and causal analysis. In recognition of his scientific accomplishments, he received the American Thoracic Society’s Behavioral Science and Health Services Research Assembly Early Career Achievement award, and the Ohio State University College of Medicine Early Career Achievement Award.